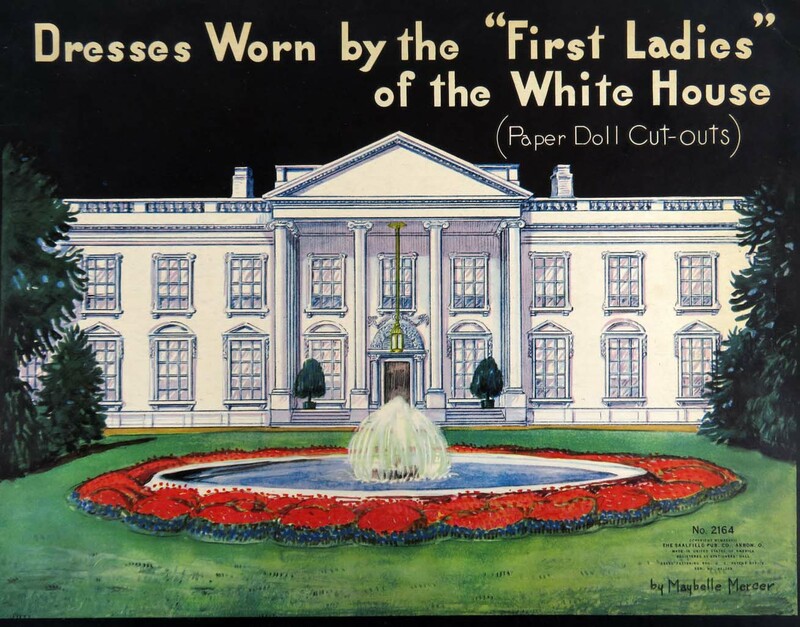 Long before the Smithsonian mounted its popular exhibition about the First Ladies of the United States, which includes actual gowns that were worn at their husbands’ inaugural balls, there was a paper doll book. 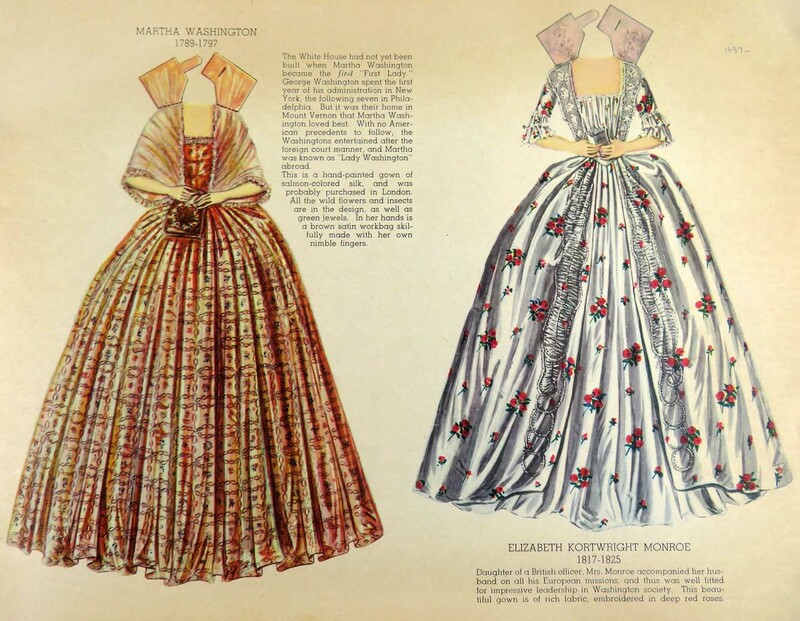 Designed by Maybelle Mercer, it’s a parade of gorgeous dresses worn by the female residents of the White House from Martha Washington to Anna Eleanor Roosevelt. 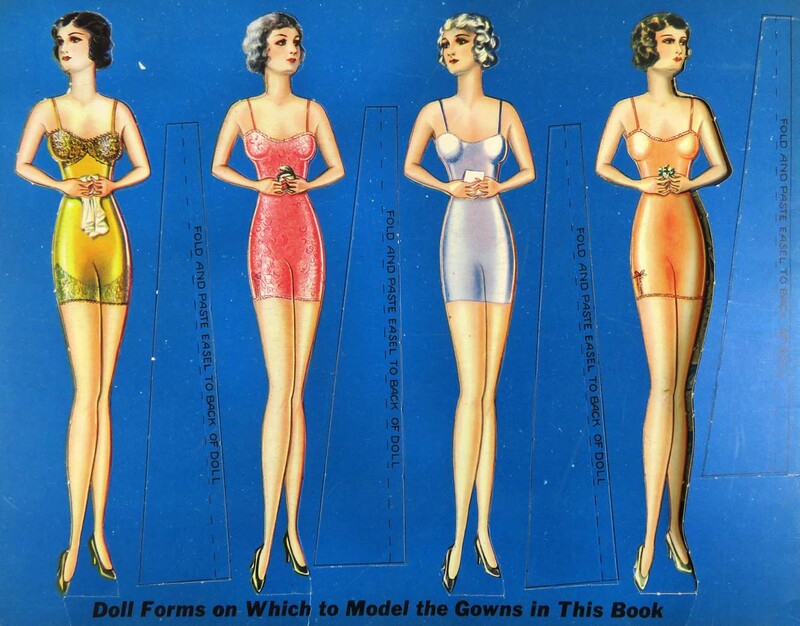 Four smartly coiffed paper dolls are printed on the back cover Tall and slim, the lengths of their torsos and limbs indicate that they must be as tall as professional basketball players. Their alluring undergarments are entirely modern–forerunners of Spanx, perhaps? 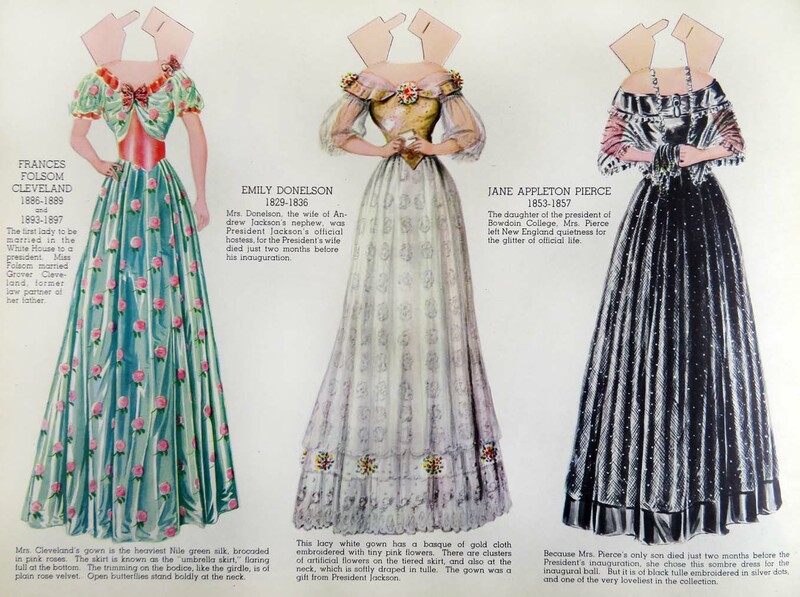 Not a token corset for historical accuracy in sight, but none of these lovelies would need that foundation garment to fit into a dress with a wasp waist. Long skirts will conceal their sleek high-heeled pumps. To stage a fashion show of the First Ladies’ finery, the dolls must be punched out and mounted on the stands provided. Then the gowns must be curated. Each dress includes a biographical sketch of the original owner and information about the fabrics, styling, and occasion when it was worn. Notice that paper facsimiles of these late eighteenth- and early nineteenth-century gowns have two unwieldy tabs to secure them to the dolls’ shoulders. The fun facts about the dresses may have taken from some other source, perhaps some between wars Smithsonian publication or exhibition. 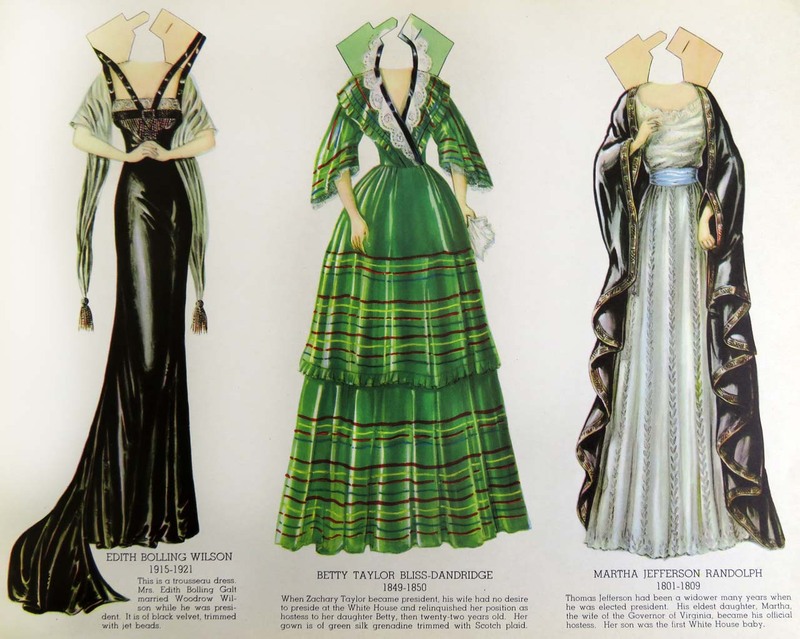 Maybelle Mercer’s paper doll book seems to be relatively common on the collectibles market, so perhaps many of the original purchasers never could bear to take out scissors and cut the dresses away from the copy, leaving an untidy pile of irregularly shaped bits and pieces. Or perhaps Saalfield the publisher kept it in print for some time. Who Can Turn the World Upside Down? The World Turned Upside Down, or The Comical Metamorphoses. London: E. Ryland, ca. 1770 (Cotsen 360). The boys crown their teacher with a dunce cap and horse him in preparation for a beating. The World Turned Upside-Down Illustrated in 16 Wonderful Pictures. London: W. Darton, ca. 1830. (Cotsen 3883). Die verkehrte Welt in Bildern und Reimen., plate 2. Stuttgart: Hoffmann’sche Verlagsbuchhandlung, 1850. (Cotsen in process 6344921). THEY CAN ALL TURN THE WORLD UPSIDE DOWN! Lin-Manuel Miranda’s showstopping number, “Yorktown: The World Turned Upside Down,” uses examples that resonate deeply with a contemporary audience instead of the symbols of subversion from below that circulated in popular prints (and even earlier in the margins of medieval manuscripts). Just a few of the traditional role reversals are featured above, so here are two “World Turned Upside Down” prints to show more of them.